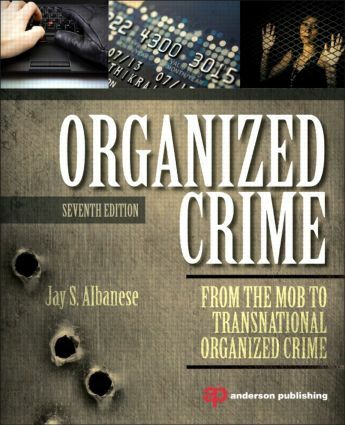 Organized Crime: From the Mob to Transnational Organized Crime, Seventh Edition, provides readers with a clear understanding of organized crime, including its definition and causes, how it is categorized under the law, models to explain its persistence, and the criminal justice response to organized crime, including investigation, prosecution, defense, and sentencing. Jay S. Albanese is Professor in the Wilder School of Government & Public Affairs at Virginia Commonwealth University. He served as Chief of the International Center at the National Institute of Justice (NIJ), the research arm of the U.S. Department of Justice, from 2002 to 2006. He is author of many articles, and author/editor of 16 books. Albanese is the recipient of the Elske Smith Distinguished Lecturer Award from Virginia Commonwealth University, the Teaching Excellence Award from Niagara University, and the G.O.W. Mueller Award for Outstanding Contributions to Comparative/International Criminal Justice from the Academy of Criminal Justice Sciences, International Section. He has served as Executive Director of the International Association for the Study of Organized Crime and is a past president and fellow of the Academy of Criminal Justice Sciences. He currently serves on the Executive Board of the American Society of Criminology.